I’ve lived in Beijing for 10 years. There are thousands of huge buildings all over, all built in the last 40 years – most in the last 10 years. All were built by migrant workers. All the workers knew that they would never have an apartment or have a job in the buildings they built. They get to go home to their villages once a year at Chinese New Year to see their wives and children. Their wives are also away from their villages, serving in cities as maids or waitresses. Their one child is raised in the village by the grandparents. There is no work in the villages with enough pay to get along, hence the migrant life. My flickr friend Jonathan Kos-Read suggested we go to a huge construction site in southeast Beijing. 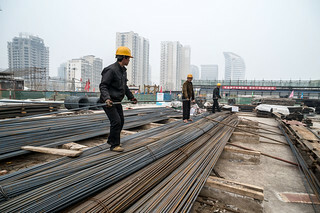 We could photograph the site and the men who build Beijing. We went Sunday March 31, 2013.